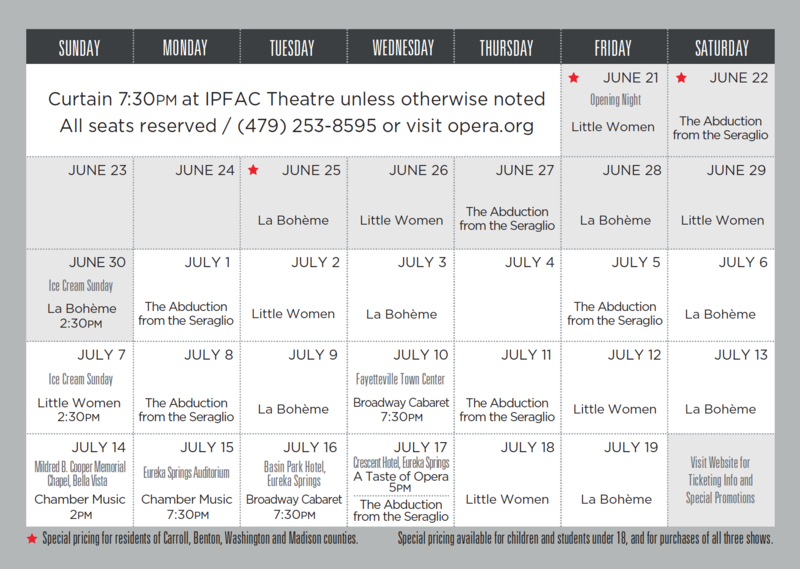 Sunday matinees will be presented on June 30 and July 7 at our own theater at Inspiration Point. The Big Dipper ice cream store in downtown Eureka Springs will be providing ice cream on those dates, hence they are designated as Ice Cream Sundays! 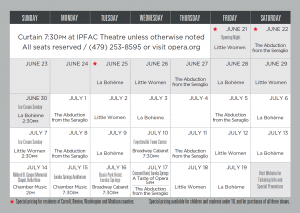 Because of scheduling difficulties, Opera in the Ozarks will NOT perform at the Arts Center of the Ozarks or at the Arend Center this season. Ono Sunday, July 14, we will feature the members of our orchestra in a chamber concert at the acoustically thrilling Mildred B. Cooper Memorial Chapel in Bella Vista. This program will be repeated on July 15 at the Eureka Springs Auditorium. Our Broadway Cabaret last year was so successful that we are offering it twice this season. The first performance will be July 10 at the Fayetteville Town Center. The program will be repeated on July 16 at the Basin Park Hotel. In both locations, the ticket price will include light refreshments and a cash bar, in addition to spectacular presentations of Broadway favorites. Tier A seats are the first four rows of the theater at Inspiration Point. Tier B is everything else. All seats at the Eureka Springs Auditorium, the MIldred B. Cooper Memorial Chapel, the Fayetteville Town Center and the Basin Park Hotel are general admission. Students under 18 are $10 for every performance except Broadway Cabaret and A Taste of Opera. There are no discounts for those events.